A compelling and inventive novel set in a world where science and magic are at odds, by Robin McKinley, the Newbery-winning author of The Hero and the Crown and The Blue Sword, as well as the classic titles Beauty, Chalice, Spindle�s End, Pegasus and Sunshine Maggie knows something�s off about Val, her mom�s new husband. Val is from Oldworld, where they still use magic, and he won�t have any tech in his office-shed behind the house. But�more importantly�what are the huge, horrible, jagged, jumpy shadows following him around? Magic is illegal in Newworld, which is all about science. The magic-carrying gene was disabled two generations ago, back when Maggie�s great-grandmother was a notable magician. But that was a long time ago. Then Maggie meets Casimir, the most beautiful boy she has ever seen. He�s from Oldworld too�and he�s heard of Maggie�s stepfather, and has a guess about Val�s shadows. Maggie doesn�t want to know . . . until earth-shattering events force her to depend on Val and his shadows. And perhaps on her own heritage. In this dangerously unstable world, neither science nor magic has the necessary answers, but a truce between them is impossible. And although the two are supposed to be incompatible, Maggie�s discovering the world will need both to survive. 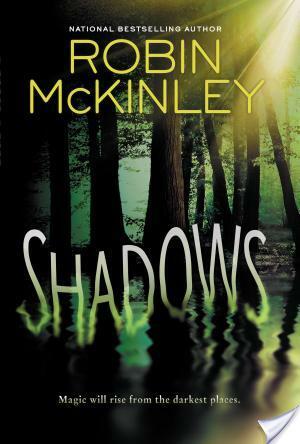 The crux of the matter is that I really, really love Robin McKinley’s books, but unfortunately�Shadows turned out to be kind of a really big disappointment. I mean, it’s not like I ever expect to dislike her books. No, instead, I go in expecting a book that is not exactly going to be a fast read, but one that will wow me with it’s strong female character and it’s intense world building. I was not wow-ed while reading�Shadows. There was no spark like with�Sunshine or The Blue Sword or�Beauty. Then again, maybe every book by an author you love is not meant to be a winner, but it sure is disappointing to think that you just can’t depend on consistent awesome from books. Shadows�is about Maggie, a teenage girl who lives in Newworld. In Newworld, magic has been disavowed. People instead rely on science which helps to save them from these things called cobeys which I guess is like a rift in the world. Anyways, Maggie is pretty content with her life. She works at an animal shelter, she has her dog named Mongo and is happy with her mother and brother, Ran. One day, this is all upended and changed as Maggie’s mom dates and then marries this guy from Oldworld named Val. Maggie thinks he is creepy and sees these shadows all around him. Until, she does a 180 with her opinion of Val. Oh, and also, there’s this guy that works at the pizza place that Maggie is attracted to named Casimir, who happens to be incredibly good looking and from Oldworld. She has two best friends, Jill and Takahiro who end up playing important roles too. And that’s all I can say about the plot, not a lot of action occurs until the very end, or the last 100 or so pages. Maggie has two things that make her kind of interesting — her love of animals and her interest in origami. Maggie has this talent with critters. She’s like the dog and the animal whisperer. For much of the book, we get to see Maggie interact with animals and with the animals and the SHADOWS playing a huge role. I will say though, I liked reading about her dog Mongo more than I really liked reading about her. I’ll say that origami plays a big role too and basically Maggie is into it because of Takahiro. Again, another important thing that I feel like I can’t expand on because otherwise you’ll get mad at me for spoilers, but honestly, nothing interesting really happens until the end. The protagonist of�Shadows is the least interesting of all McKinley’s heroines that I’ve encountered so far. Really the best thing about her is her critter skills and well, the critters kind of overshadow her. Frankly, if you don’t like to be confused and just thrown into a world, you should probably pass on�Shadows by Robin McKinley. I mean, I gave it my best while reading. I was patient, I thought give it some time and I will figure it out. I was right, I did eventually figure out the world, kind of. There’s still things that I am confused on, like what the silver bugs are (they play a big role), the division of the world — Newworld, Oldworld, Farworld, etc. Like, this is a world where there is magic and there’s science. It has the potential to be fascinating. Yet, the focus is not on the fascinating world, but on a small, boring piece of that. There’s just so much potential and I feel like it was wasted on a meandering story. While I usually am the biggest fan girl when it comes to McKinley, I felt like this book was so drawn out. Like, it just seemed to go on and on and on and on with nothing happening. Yet, I never DNFed it because I cannot do that to a book by one of my favorite authors. I found myself confused and disinterested. I am someone who usually reads every day for a good amount of time. Yet, with�Shadows�I found myself doing other things and just in a sort of slump. Now, you might be wondering why on Earth I would rate this a three when I have so many complaints about pacing and plotting. Well, the world is unique. The critters are interesting. And I liked the blossoming romance that happened, even if it was a bit quick for my tastes. Hence, the three. Also, in less capable hands, this story could have been the utter worst, but it wasn’t. I have only ever read Beauty by Robin McKinley, but I do have a few of her other books that I haven’t gotten around to read yet. I loved Beauty, though. I’m sad to here that this was disappointing. It’s always difficult when a favorite author releases a book that you aren’t in love with. I’m a huge fan of McKinley as well, and I’m kind of dreading to read this. I have Pegasus on my shelf that had mixed reviews, so we’ll see. Anyway, thanks for the honest review!